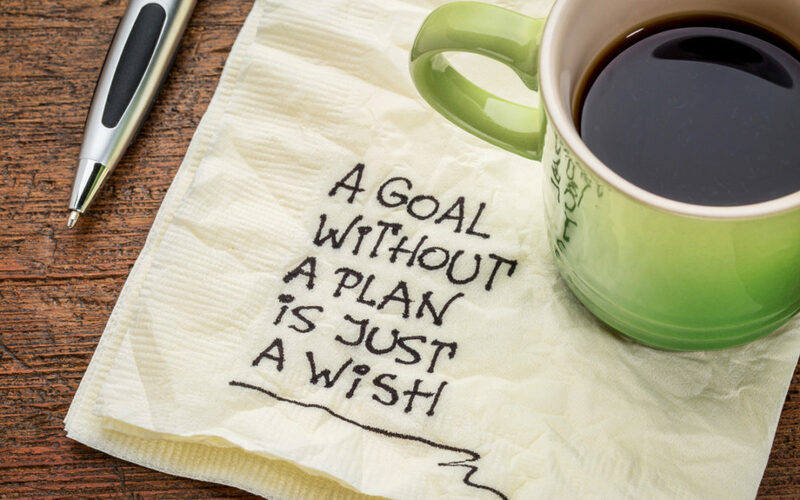 As you get ready to begin your health and fitness transformation, the very first step you should be taking in order to guarantee you see success is setting some clearly defined goals. Many people breeze right through this step because they have their long term ‘vision’ in mind and feel that’s all they need. But, make no mistake, if the only thing you have driving you forward is that long-term goal, it will be very easy to lose sight of the light at the end of the tunnel, so to speak. By setting good goals, you can ensure that you stay focused, motivated, and are going to see the overall results that you had hoped for. Sadly, many people make a few fatal errors when they do go about setting goals, so our mission here today is to ensure that you can side-step those errors and get yourself on track to success. How many times have you heard someone say their goal is to ‘lose weight’. That’s it. They just want to drop some pounds. While that’s fine, the fact of the matter is there is no defining how many pounds they want to lose. Do they want to lose 5 kg’s? 10 kg’s? 20 kg’s? This makes a BIG difference in the overall approach you need to use. If you are looking to lose just 2-3 kilograms, you are not going to have to come up with nearly the elaborate plan going forward compared to if you have to lose 10 kilograms. Most people can lose a couple kilograms by just making a few simple changes to their eating habits and upping their workout frequency a little. If you want to lose 10 kilograms however, you likely will need to revamp your diet a bit and look long and hard at your current exercise habits. When you set a goal, you want to be as specific as possible. This means defining that goal so much that you can visualize it easily. You’ll know exactly when you reach it. If you’ve set the goal for instance to lose 5 kilograms and you’ve currently lost around 2 and a half kilograms, well you know you’re halfway there. If you’ve just set the goal to ‘lose weight’, you have no clue where you stand. This can be demotivating in itself. Whenever you set a goal, no matter what the goal happens to be, try and be as specific as possible. Define that goal so there are no questions about how you’re doing. The next mistake too often made is not accounting for the ‘life’ factor – basically, the fact that life may get in the way at times. You might set your goal, thinking you will do XYZ and arrive at your end goal. Perfect – you’re set. But, things come up. You may have a big project at work and can’t do your workouts quite as often or you may suffer from being ill for two weeks and have a total set-back. It’s important that your goals are somewhat flexible or at the very least, allow some wiggle room for this life factor. For instance, if you have a high school reunion coming up and want to drop 10 pounds, don’t give yourself an ultra-tight deadline to do this. Allow for a few extra weeks beyond the time you think it’ll take you so that if something does come up, your entire plan isn’t totally thrown off. When you don’t allow for this time, when something does come up that makes it hard to continue, what you’re going to be faced with is serious frustration, feelings of being a failure, and you may be tempted to give up entirely. These things must be avoided. The third mistake too often made by those who are trying to set goals is setting only extrinsic goals and forgetting about the importance of intrinsic goals. Extrinsic goals are those goals that focus on external factors. Most people with the goal to lose weight have these types of motivations and there’s nothing wrong with that. It’s just that you want to also have another type of motivational drive pushing you forward – one that’s deeper and more meaningful. These intrinsic factors are less measurable than the above, but they are the ones that tend to keep people coming back for more. When you set a goal that tends to be driven more by other people – impressing those people or doing what you think they expect or want of you, it’s unlikely that goal is going to stick for long. Sure, you may get through a six week program solely based on the motivation to step onto the beach in your bikini, but after that beach vacation is over, chances are, your motivation will be crushed. If you also have the goal to sustain higher day to day energy levels, then exercise will likely become a part of your overall lifestyle and something you always strive to do. These goals set you up for long-term results, not just a short-term quick fix. Finally, the last mistake you want to avoid making is neglecting your resources. It may be great, for example, to set a goal to train for an upcoming marathon, but if you only have an hour, three times per week to devote to exercise, the chances of this happening are slim to none. Marathon training simply takes longer than that. Or, if you have the goal to get down to 15% body fat but hate cooking for yourself and love eating out at least once per week, this may not be realistic. Unless you have meal prep skills and can change your views on preparing your own food, you likely won’t get down to that low of a body fat percentage. Take into account how much time you have available, the support system you can employ (personal trainers, nutritionists, etc. ), and the equipment availability you have at your disposal. These will all need to be factored in when deciding what appropriate goals are for you to strive to reach. Don’t let this discourage you though. There is a lot you can do without a great deal of resources, but you want to be sure you aren’t climbing an uphill battle before you even start. Position yourself for success so your chances of moving forward and seeing success are greater. So all of this said, how do you go about setting goals that get you results? First, note that you want to set both short term and long-term goals. Your long-term goal should be a goal that you can reach in 6 to 12 months. Your short-term goals should be reachable every 2-3 months. Each short-term goal should be a stepping stone on the path to a longer term goal. Then, once you have these goals in place, you’ll want to set daily objective goals as well. These are tiny goals that you set for that day. Something like drinking more water or adding another serving of vegetables to your dinner. With each of these daily objectives you achieve, you’ll get a boost to your self-esteem that you can achieve success if you put your mind to it. If you follow these goal guidelines, you should have no problem seeing the results you desire and enjoying the process at the same time. Remember to also recheck your goals regularly and ensure they are on track and still applicable to you as well as this will help maximize your chances of success going forward.